The November issue of Nintendo Power is making its way into readers’ hands and inside is a preview of the Nintendo 3DS version of Sonic Generations that reveals Tropical Resort as a stage in the game. SSMB member speedfreak says the preview contains screenshots that show it’s not a recreation of the level seen in the DS version of Sonic Colours, but of the Wii version of the game. 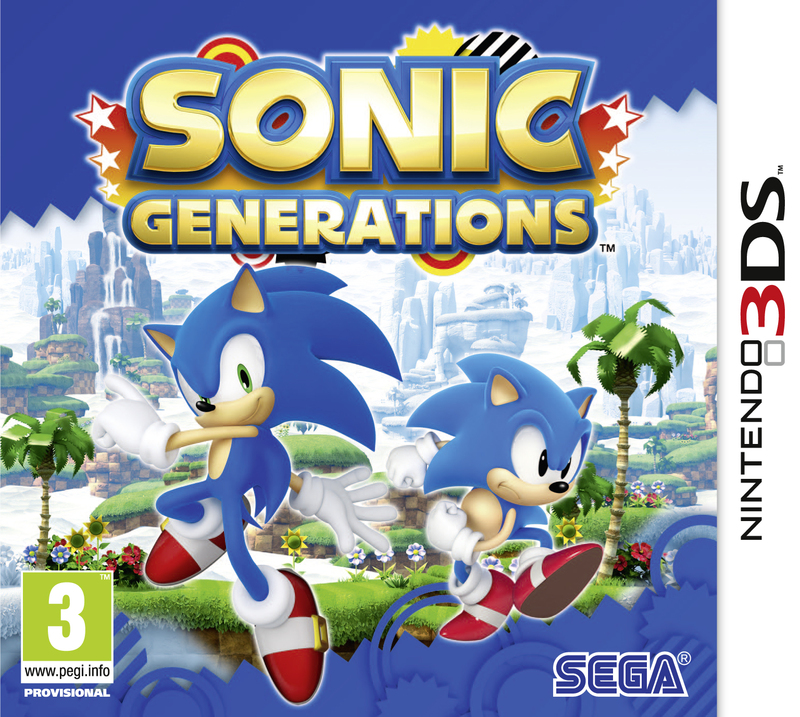 It now appears those hoping for some handheld stages to return in this version of Sonic Generations are out of luck. We now know six of the seven stages in the Nintendo 3DS version. We expect SEGA will reveal the last in the next few weeks as we get closer to the game’s release November 22nd in the US and November 25th in Europe. Thanks to speedfreak at the SSMB for the heads up! < Previous Post Previous post: #93 Opening Cutscene of Sonc Generations revealed. The “History of the First Stage” name suddenly fits the 3DS version completely. Well, not completely. Casino Night Zone is in the 3DS version. Shadz there is typo. You wrote US twice 😉 Happy to help. It was the right one. The 2 above yours are answering replies to the comment’s first reply, while yours is answering the inital comment. Also, Radical Highway isn’t a First stage either. Only four levels are the first stages :P. Four levels of the console and PC version are also first stages. That were the problem is many people see it as the first speed stage in the Dark story of SA2 instead of it being the fourth level of the Dark Story. Also I think I heard that Radical Highway was originally going to be a Sonic stage instead of Shadow. So I can see why Sonic Team would pick it. Also Sonic technically goes to Radical highway in the 2 player mode so…. hmmmm…. yeah I would’ve prefered Metal Harbor. it could be a small glimer of hope that metal harbor isn’t in cuz Hugh Crisis is the semi final stage. Also what four stages on the console are first stages? Of course it’s closer to the Wii version. The DS version was completely 2D, but the 3DS can afford to have more detailed backgrounds than the regular DS. Closer to Wii quality. And in a sense, because it will be completely 2D, it will be closer to the handheld version. I have a hunch that the remaining stage will be from a Rush title. If that is so, we’ll get two handheld stages (Tropical Resort IS a handheld stage too). Personally, I don’t care either way. It’s really cool to see the levels recreated for the 3DS, regardless of which stages are picked. No, speedfreak means it’s based on the Wii version’s design, not that it’s graphically closer to the Wii version. That would be hard to tell from a handful of screenshots. In that respect, hopefully it will be nothing like either, as then it would be a bit of a rip off. Also, it doesn’t bother me that most stages are level 1. As long as they’re varied (and they are – all completely unique to each other), I’m fine with that. Yeah, I’m fine with the 3DS version’s level choices so far too. I wonder why they didn’t use handheld stages, it would have made sense to. Like Crystal Egg, Water Palace, Blizzard Peaks etc. Green hill Zone was awaste of a slot. I understand why they wanted it in both versions, but for the 3DS it should have just been one act split into two halves, as a tutorial level. I actually believe that Emerald Hill Zone would have been a better match than Green Hill zone in Sonic Generations 3DS. Because the handheld stages are a load of crap, I would rather play casino night and mushroom hill than crystal egg. However I would like to see a sonic advance stage and a sonic rush stage just for the sake of it being a handheld game. the only stages i can see them puttting in are adabat and egmanland(plus eggmanland follows the trend of being referenced in the console version repeatedly like casino night and emerald coast.) lets go eggmanland!!! What will the last one be? Where are Rush and Rush Adventure? And we never saw silver in Rush or RA.. and hes the boss of a level… so that means… a 06 stage is coming… and Rush or Rush Adv stage will …. be DLC? Anyways idc if we dont get a Rush or RA level anyways… i would like a 06 level cause i never played that game..
You fight Metal Sonic in Casino Night, so I wouldn’t be surprised if Silver pops up somewhere unexpected, instead of an 06 stage. That said, Kingdom Valley would be interesting. Kingdom Valley would be fantastic to play through. If we don’t get a handheld stage as the last one, then kingdom vailley is a must. LOL i always face palm myself when people think there is going to be completely new levels for DLC. Goin’ back to Tropical Resort’s gonna be fun! Though I’m still hoping Holoska’s Cool Edge from Unleashed makes it to the 3DS version… C’mon SEGA, just ONE snow stage is all I ask! Honestly, I would rather have Sweet Mountain as the colours stage, but I’m not too bothered. I think the biggest compliment for Sonic Colours is that there’s no obvious choice for which level to pick. They all stand out. The level list on this game is boring. This means Tropical Resort’s music gets another rendition! And we can all agree on how brilliant that is. Celebration of Sonic’s handheld history… Even if the last stage is it, we’ve been trolled hard. At this rate, I might end up believing that the Rush stages are multiplayer only, and the 7th stage possibly being Kingdom Valley. I don’t know why, I just do. Ugh, if only that 8th stage were true… I’d imagine that the site would be put back up by now. So, wait…the 3DS version won’t have the same amount of levels as the console? Shadzter edit: Please stop posting links to leaked content. I hope it’s Kingdom Valley! “Forgive me if I withhold my enthusiasm” Princess Luna. Tropical Resort was a spectacular opening level to Colours. I’m happy that it’s returning for an encore! 😀 but sadly, there are certain things “missing” from Generations that have let me down badly… I’ll leave it at that. Don’t get mad at me, but I wasn’t fond of either version of Tropical Resort. They seemed rather bland. I preferred… Well all of them apart from that one really. Well to me the graphics are okay, and I have to say that a lot of Sonic games are short but you always go back and replay the levels because you usually find some sort of secret pathway or something. Plus have not heard that the game offers 100 unlock able stages. I for one believe that this game will succeed both on the console and on the handheld and people will like it. I’m not too interested in the 3DS version of the game, but I’m still looking forward to the music from it. Can’t wait for the remixes of the Tropical Resort theme! Ha, I remember creating a thread of the Sega forums saying this stage was confirmed months ago. (Sega had a stream and Tropical Resort had remixed music) Funny to see it finally confirmed. Not sure why people are complaining about this stage. Tropical Resort was one of the stages that represented Colors (Many Cutscenes were here and it was the center of the game.) It is a much better stage choice then the rumored Asteroid Coaster level. I’m hoping that there isn’t a handheld stage. The handheld stages aren’t too good. I would rather play a sonic heroes stage, or a sonic unleashed stage. or do I dare say it, A sonic 06 stage. I would rather see a new kingdom valley or a new dusty desert or any old crap from sonic 06. That’s how serious I am! I still remember when Generations 3DS was actually going to be handheld stages, except without any Game Gear ones for some reason. What if the ’06 stage is Kingdom Valley? I’m not too dissapointed about there being no handheld stages, honestly. I do wish it was true, since I think I recall Iizuka hinting it a while back. Something about 3DS being a celebration of Sonic’s “handheld past”? XD I really like the fact that people are saying Holaska and Kingdom Valley. Holaska is alright and we need a Ice Stage. Oh yeah, Skyscraper Skamper act 1. Awesome. Tidal Tempest is also a playable stage. Game Stop store manager told me he played it at a manager’s conference. I also had a chat with a Gamestop store manager, and he told me that Sonic Generations 2 would be released in February 2012 and have twice as many stages as the first. Then Sonic Generations 3 around this time next year to round off the trilogy, featuring an epic battle between all characters, classic and modern, in super form, versus classic and modern Eggman, also in super form. He played them at a manager’s conference. Knowledgeable people, these Gamestop managers. Lol, GameStop employees are such trolls. Question is, if Unleashed makes the cut, will they pick the Wii/PS2 version, or the HD vserion to base it off of? Probably Wii as Dimps helped out with the day stages in the Wii and PS2 versions. I don’t really care if there aren’t any handheld levels in the 3DS version – after all, the levels are supposed to be memorable ones and not many people have played the handheld games besides the Rush series of games and Colours. What would be smart would be if instead of using a Heroes stage, they used a stage from one of the Advance games (the Advance series is part of the Dreamcast era since it introduces characters like Cream, Emerl etc. ), then the Modern era is made up of Rush, R. Adventure and Colours. Better yet, if it turns out that the 3DS version DOES have 8 levels, then it can include a Heroes stage plus the ones that I just named. And I love how some of you are acting as if there are 9 levels in this game without even noticing it. Oh yeah! I totally forgot! NEW MOST WANTED LEVEL: EGG FLEET! God! I loved that awesome level in Heroes! I think most people fail to realize that this game is supposed to reflect the most memorable iconic stages in sonic games. Of course, most of them would be the “WHOA” stages of the console games. Yea…but from this sega can tell what they SHOULD do with their next couple games in the future. Either they will do a new era of sonic, or they can actually do SA1 and SA2 the way they did generations…i say go for it. Personally, I appreciate the nod to Colors, but we could use a stronger choice than Tropical Resort- heck, that was one of the least interesting stages, in my opinion. When you’ve got stages like Sweet Mountain, Starlight Carnival, Asteroid Coaster, and Aquarium Park, why choose one of the least-spectacle oriented stages? The others all have ridiculously memorable moments and aspects, Tropical Resort seems a little dull. Interested to see when the final one or two levels are- so far, the DS stages have actually really been interesting choices, aside from this one. Glad to know dimps cares about Sonic fans so much. but.. no sonic heroes stage? oh yea.. forgot bout the special stages..
but i mean… like a stage stage. cuz they said one more stage right? and 06 and unleashed are missing..
G-Mel please! You’re still around according to Advance 3 ending…but no trace of him is seen. Wish he would come back. Last stage would probably be something iconic from either 06, Unleashed or Rush, Heroes. I know I’ll still enjoy the 3DS version but, I still wish they did do the handheld stages. It could have been like the Game Gear Era, Advance Era, and the DS Era. It also could of had different rivals from each era like Fang/Nack (GG), G-mel (Advc), and Blaze (Rush, I love Vela-Nova) instead of the same ones as the consoles. I know that many people enjoyed the advance series, rush series, and sonic colors ds alot as so did I. So that’s 6 games for 6 stages. Plus I think the handheld had the more interesting and more involved rival character fights. The game gear would be harder to really some well known stages but, it has its share of good ones. Plus, It has Sonic 1 (It also had Green Hill), Sonic 2 (one of my fav invincibility theme), Sonic Chaos (some interesting bosses), and Sonic Triple Trouble (I played and had the most fun out of) to chose from. Just like how the genesis era has the choices of Sonic 1,2,3&Knuckles, and CD. @K-Weezy has a great point but, it’s also about Sonic’s History. The first meetings of Tails, Blaze, and Cream were on the handhelds. Sure, there not as well known as the consoles but, normally when the console were getting all that hate, the handheld were usually something to look forward to with positiveness, playing a big part of Sonic’s History and helping him to keep running strong. I thought all these 3DS stages would make it onto the console as DLC later on the road rather than, well, the 3DS. Come on, all of that white space hub world is begging for DLC. I stil think the 3DS will do well but, I rather they went into the different route. this… was very well put.. and i have to strongly agree with u, no doubt. Plus, I could so totally see M.Sonic fighting a Sonic Advance 2 boss. Don’t lose all hope for handheld stages, guys, it’s possible that they’ll be the 2-player versus stages instead. Not a single handheld level, nice one, Dimps. you really think it was dimps choice to not have any handheld levels? Well, seeing how they’re developing it and they’ve developed numerous handheld Sonic games they would try to get some of those in. But I digress, you might be right, the power is in Sonic Team’s hands. Heroes: Was there something besies SSH in that 20th anniversary video? If so, then that one. Shadzter edit: Thanks for the heads up, but we don’t post scans up due to copyright reasons. We don’t allow links to them in the comments either for the same reasons. Thanks for the share! This gives alot of Info. Looks like Yes Tropical Resort is an official stage and you can use color powers 😀 I seen some Pink on the side with that Danger Sign so maybe Spikes was Reincarnated into the 3DS Version like the Consoles.. I find it intersting that those rockets that are in mid air, I believe that wasn’t there in the original Tropical Resort Wii version ( and I’m sure of it cuz I played Tropical Resort on the Wii today) so can someone who has played the DS version please tell me if that was in Tropical Resort DS? Also I don’t think that that pink stuff is spikes cuz it would have tralled off of classic sonic as well. Maybe we can see void and red burst wisp for the DS version. Ehh I really dont think that those are rockets they look Like Mini Sized Fire Works. everybody lets hope the last stage is kingdom valley i just saw the level on youtube and it was epic! the dreamcast era boss? im guessing egg emperor and it would be neat if he was the dreamcast boss. what do you guys/girls think the dreamcast and modern bosses are? this japanese screenshot with Silver came out and it clearly showed that the first three dots are the classic era the exclamation mark seems to be the boss/rival gate, then the next two dots are the dreamcast era with another boss/rival gate. and the final two are the modern era with the rival/boss gate. the last dot being time eater. So when everyone was saying Kingdom Valley could be a stage i tottaly agree with that but, the platformer was the PS3. If you look at Unleashed You see that the platformer was Wii,Ps2,Ps3 and Xbox360 so the 3DS Would match the Wii Expectations. Eggmanland,Apotos and Holaska might make the cut. it was also on the 360, it wans’t a PS3 exclusive. Another website uploaded the nintendo power preview. I reveals that the Cyan (Laser) Wisp and Red (Burst) Wisp will be in generations. Looks like Tropical Resort is getting some love between its two verisons. The Wii Version with the level design concept and the DS verison with the exculsive wisp in it. the preview also says that at certain points in the game you learn new skills. Classic Sonic learns the homing attack and modern sonic learn the stomp attack. So it could be very possible that Classic Sonic doesn’t have the homing attack in the Classic Era but learns the ability as he moves to the dreamcast or modern era. Red Burst is in there? Then it represents a handheld after all. Yes it has Wii elements but it means that we may indeed see a Rush or Rush Adventure stage in there. Silver was originally fought in the Soleana Hub World, yet you fight him in Crisis City in Sonic Generations White. You meet Silver in Sweet Mountain in Sonic Colors DS, maybe you are going to fight him in Tropical Resort, since he got sick of all of the candy and stuff and decided to go back to the amusement park’s lobby? shadzter placed it somewhere on the SSMB sonic generations thread. Has the Final Hazard been thrown completely out of the window? I would think that the 3ds version would feature this boss as the dreamcast boss in order to match Perfect Chaos from the console version, as well as to give a revamped version of ‘Live and Learn’. From a musical standpoint, featuring ‘Open Your Heart’ on the White soundtrack and ‘Live and Learn’ on the Blue soundtrack would ensure both copies are bought. Of course, another reason for having the Final Hazard is that the boss is simply epic. Based off of the known stages and Izuka’s comment about handhelds, I would optimistically presume that the last level is from Sonic Unleashed or one of the Rush titles so that it fits into the ‘Modern’ era. Both of these games are relatively known to Nintendo fans, who are the target audience of the game. Sonic and the Secret of the Rings is a slim possibility based on its inclusion in the 20th anniversary video featuring all of the main games of the series, but, as with Sonic Next Generation, it may not have as popular of a choice. The levels for the game were chosen based on polls conducted by Sega, so only the levels known by the voters (typically the first stage or an extremely iconic stage) would be considered. With that said, I cautiously predict that the final level will be Apotos from Sonic Unleashed, Sand Oasis from Sonic and the Secret of the Rings, or either Water Palace Zone, Coral Cave, or Blizzard Peaks from the Sonic Rush series. These stages are near the beginning of the game, where people remember the stages the most. Additionally, these stages have water features which would allow for the ‘mandatory water level’ that appears in virtually every Sonic game. Since photos of the Emerald Coast stage have yet to show either Sonic platforming underwater, it is safe to assume that a water level has yet to come. Alternatively, Chun-Nan Day from Sonic Unleashed, Night Palace from Sonic and the Secret of the Rings, or Dead Line Zone from Sonic Rush could be featured. Just throwing those out there. It’s not going to happen, but in another reality it might. As for the ‘Modern’ boss, we can expect one of Eggman’s inventions so that the boss order follows the console version of classic Machine, monster, modern machine. This boss’ identity is still up in the air, so it could be anything from the Egg Nega Wisp from Sonic Colors to Exception (featuring the most epic music ever) from Sonic Rush. I would count out anything from Sonic and the Secret of the Rings due to the fact that Eggman is not in control; the Erazor Djinn would be more of a rival battle seeing as though the character has consciousness above a normal boss. Eggman mechas from Sonic Next Generation are possible excluded due to Silver’s role as a rival, but that would cause a contradiction for the Final Hazard hypothesis, so Sonic Next Generation bosses are still a slim possibility. The machines from Sonic Unleashed have an equally slim chance due to the Egg Dragoon’s inclusion in the console version of the game, but once again, almost anything is still possible at this point. This is all pure speculation but hopefully at least part of my prediction will come true. I had an inkling Radical Highway would appear, and lo, it did. Now, say it with me… Chun-Nan Day and Exception! The last stage would probably be either Kingdom Valley or Radical Train from 06, since those were the other moderately original stages in the game, or Cool Edge or Eggmanland from Unleashed because there isn’t an ice stage in either Generations, and Eggmanland was the closest Eggman got to actually winning. Either the last Sonic Generations stages are. In the NP article, they accidentally listed the release date of SG as Feb. 2012. Oops!